Plate III. 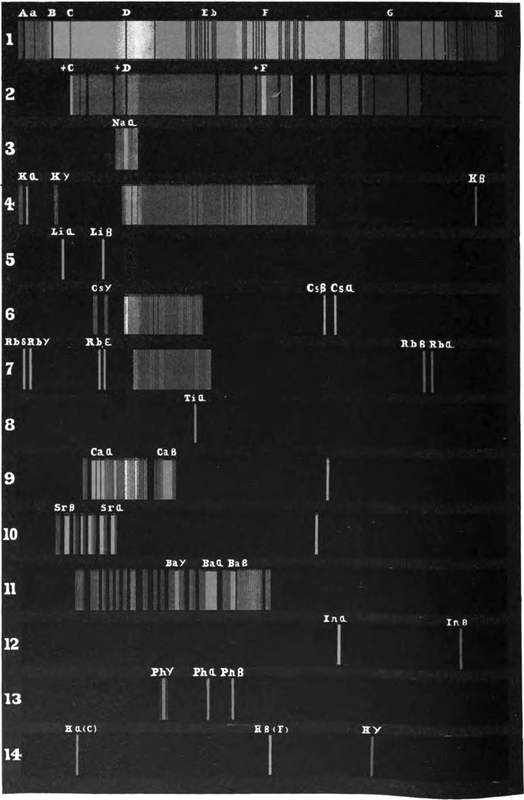 Spectra of various sources of light. 1. The Sun. 2. The Sun’s edge. 3. Sodium *. 4. Potassium *. 5. Lithium *. 6. Caesium *. 7. Rubidium *. 8. Thallium *. 9. Calcium *. 10. Strontium *. 11. Barium *. 12. Indium *. 13. Phosphorus *. 14. Hydrogen *. p.s. : could be windows in a building conceived by Mies or Gropius.